Cyber Monday deal: Save £100 on Award-winning KEF Q350 speakers | What Hi-Fi? Several hi-fi speakers were on the receiving end of tasty Black Friday discounts (such as the Award-winning B&W 685 S2S for £299 and over £65 off the five-star Q Acoustics 3050i speakers) - and some have even rolled through to Cyber Monday. 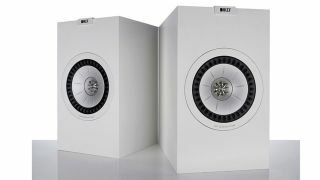 One of the very best speaker deals still available is a £100 discount on the KEF Q350 standmounts, current What Hi-Fi? Award winners in the ‘Best standmount speaker £500-£750’ category. These KEFs are now just £400 - down from their original price of just over £500. That’s not bad for brand-new speakers that are ‘a cut above the rest’ in their price category, as we described them in our five-star review. That glorious £100+ saving is available at Richer Sounds, Sevenoaks and Peter Tyson. But you might want to hurry as we aren’t sure when this deal will end. Alternatively, you can click through to the retailers from the deals box below to see the new discounted price.